Commercial property yields continue to trend downwards as owner occupiers compete with investors seeking a reasonable return on their investment. The Reserve Bank of Australia (RBA) hasn’t changed the target overnight cash rate since August 2016, when it cut it to an all-time low of 1.5%. We have now seen the longest period of stable rates for 22 years and many experts do not expect the RBA to change its stance for at least the remainder of the year. Despite Australia’s sluggish economic growth of around 2.25% in 2017, growth in the global economy will put upward pressure on bond yields and interest rates which will in turn affect our market, particularly our largest two cities of Sydney and Melbourne. In fact, the US Federal Reserve has raised its cash rate above that of Australia for the first time in 18 years. CBRE expects further convergence of growth rates across Australian capital cities in 2018 as Sydney and Melbourne moderate slightly and growth picks up (from lower bases) in Queensland, WA and ACT. Housing activity reached its peak contribution to the economy in 2016 and is likely to be a negative contributor towards the economy in 2018 (although residential applications rebounded strongly in February with a 64% month on month increase to total $6.1b). Factors that will help to offset this include non-mining capital expenditure (which demonstrated a strong turnaround in H2 2017), rising global resource prices, public infrastructure plans (particularly on the eastern seaboard) a falling unemployment rate (despite a rising participation rate) and rising company profits (which should lead to rising wages). Overall, total annual capital expenditure looks like it will be positive in 2018 for the first time since 2013. In terms of demand for office space, innovation is also changing the amount of floor space required by white collar workers. 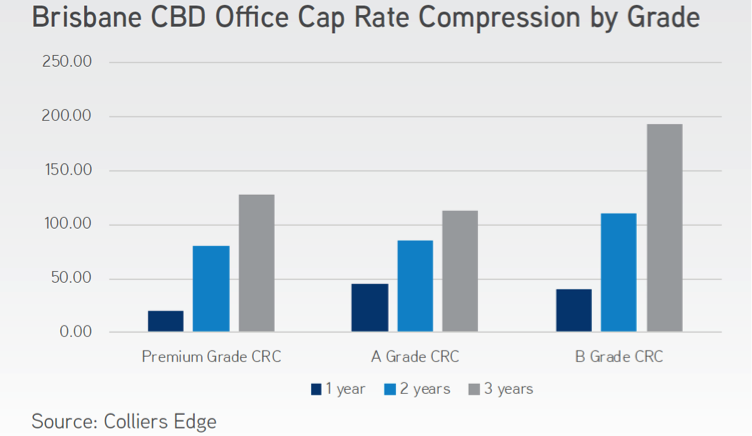 In an extension of ‘hot desking’ policies, larger corporations are flocking to flexible use space in prime CBD buildings. Previously, flexible use space was mainly the domain of start-up and IT companies looking for flexibility and affordability, however more recently much of the demand has been from established corporations with up to 250 employees that are looking to reduce their costs by reducing the average space per worker from around 15sqm (including shared facilities) to 3-5sqm. In years to come, this will significantly affect the vacancy rates (particularly in Melbourne and Sydney) as more space become available for lease. The Sydney and Melbourne office markets continued to outperform in 2017 though on the back of strong fundamentals, with the prime vs secondary yield spread for the Sydney CBD market at an all-time low of around 30 basis points. This appears to be reaching its limit as we reach the cyclical peak and demand starts to migrate back towards to prime stock. 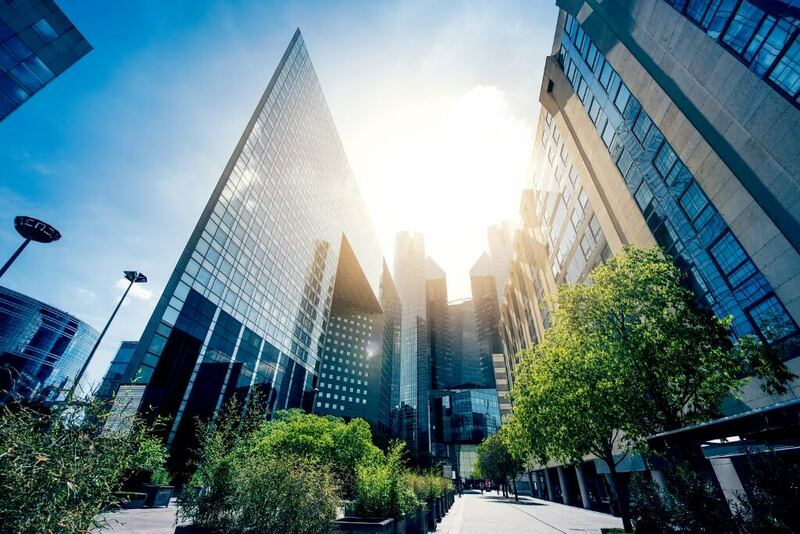 Prime office property still presents fantastic opportunities for those able to capitalise on them, with relatively high yields compared to residential property, long lease terms and minimal maintenance required for many properties. The Brisbane area is now presenting itself as a long-term value opportunity with the long forecast pickup in the economy gradually building steam as demonstrated by the pickup in the number of jobs created. The Sydney CBD office market continued its strong run in 2017, with net effective rental (NER) growth for prime and secondary property of 14.3% and 19.5% respectively and strata capital values up a stunning 33% to $10,127/sqm; a strong contrast to the residential market., CBRE expects the growth rate to moderate but remain strong throughout 2018 and vacancy rates to decline from 4.6% to 3.6%. Total withdrawals reached around 200,000sqm in 2017, primarily due to Sydney Metro and residential/hotel conversions. 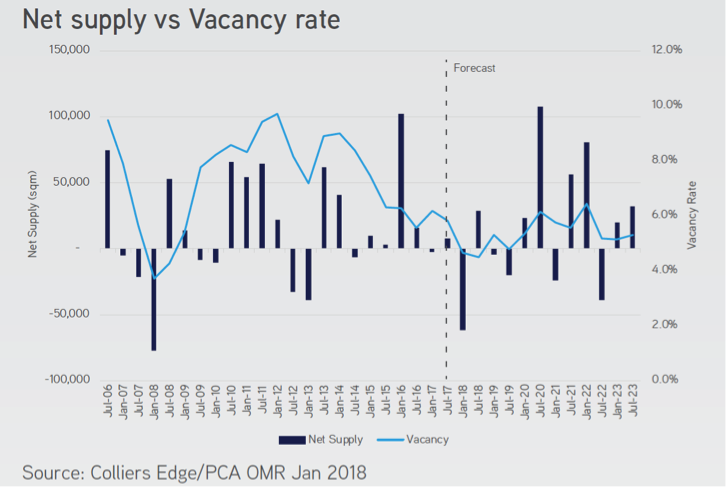 A lack of new supply is also helping to push vacancy rates lower, which is not expected to change until late 2020 or 2021 as major projects are completed such as Wynyard Place, Quay Quarter Tower and Circular Quay Tower. Around 80% of forecast completions for 2018 (mainly refurbishments) are pre-committed. Due to the lack of available contiguous floor space in the CBD, several larger companies have relocated to North Sydney. On the back of this strong demand, a lack of new supply and significant withdrawals for Sydney Metro, North Sydney experienced the strongest prime NER growth across Sydney’s major metropolitan markets in 2017 of 15.4%. Other metropolitan office markets are more treacherous, such as Parramatta. The supply pipeline comprises 13 new major office projects, none of which are pre-committed. Although yields of around 7% can be obtained for secondary property, the vacancy rate sits at 6.7% and is likely to increase in the medium term. Regional markets such as Newcastle (and increasingly the Central Coast) have experienced strong demand over the past few years as investors sought out higher yields of 6-8%, although sub $1.5m properties with leases in place are highly contested and may sell with a sub 5% net return. This has boosted capital values, although net face rents have remained relatively stable, which has pushed yields downwards in line with other markets. Vacancy rates for A grade property sits at 6.4%. Melbourne CBD also demonstrated strong results in 2017 with premium, A and B grade space experiencing NER growth of 11.7%, 10.5% and 11.6% respectively. Colliers expect similar growth rates in 2018 due to ongoing strong demand which will push the vacancy rate downwards from 4.6% (which has already fallen dramatically). Supply will also be limited (which recorded -8,222sqm over the second half of 2017, compared to the average of +40,000sqm) until the second half of 2019 and the first half of 2020. 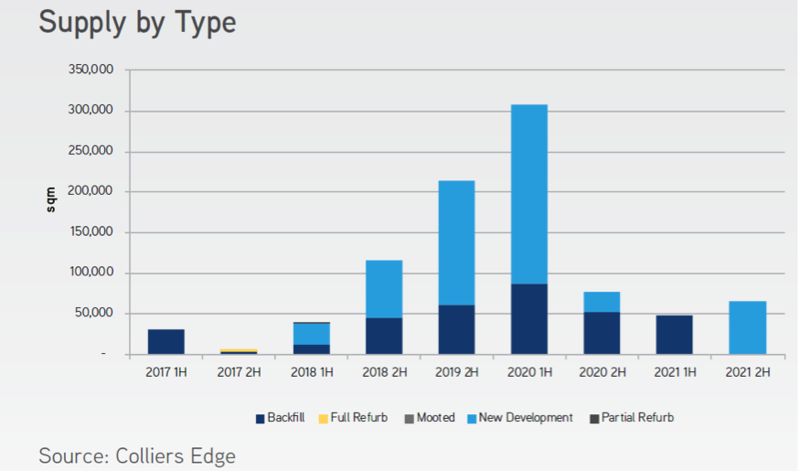 Although the majority of this is already pre-committed, vacancy rates will increase from their near record lows due the sheer scale of these developments before retracting again in 2021. As in Sydney, demand has pushed out from the CBD due to limited available stock. The St Kilda Rd precinct saw a strong uplift in capital values in 2017 as investors saw the relative value (of around 6% returns) compared to Melbourne CBD, Sydney and international markets that sit at 5% or below for premium stock. The Brisbane office market is currently a long-term value play, with Herron Todd White placing it at the ‘Bottom of the Market’ on its property cycle clock. It is slowly making the transition from a resources-based economy to a more broad-based economy with a greater importance placed on tourism, education and professional services. 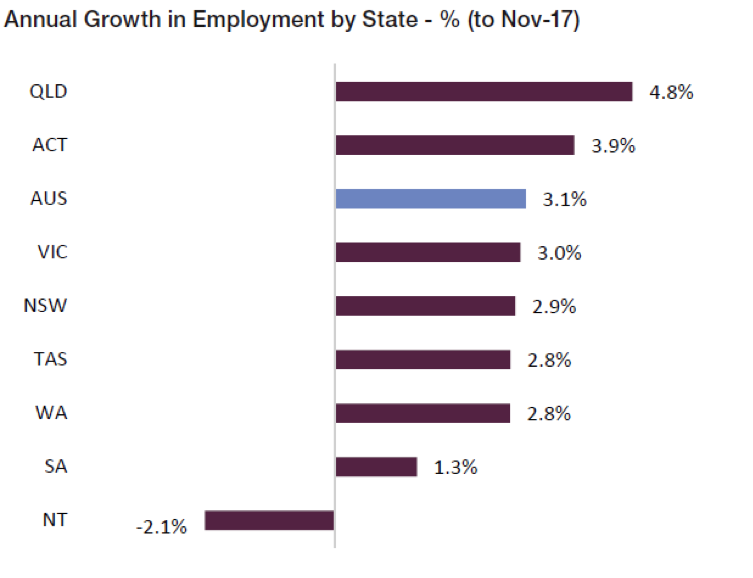 It appears to be working, with QLD professional job advertisements up 5.4% over the 12 months to Oct 2017 and overall employment growth of 4.8% over the 12 months to Nov 2017. Net effective rents are forecast to creep up slowly over the next few years, however growth in capital prices will compress yields further, which are down to around 6% for prime office space. 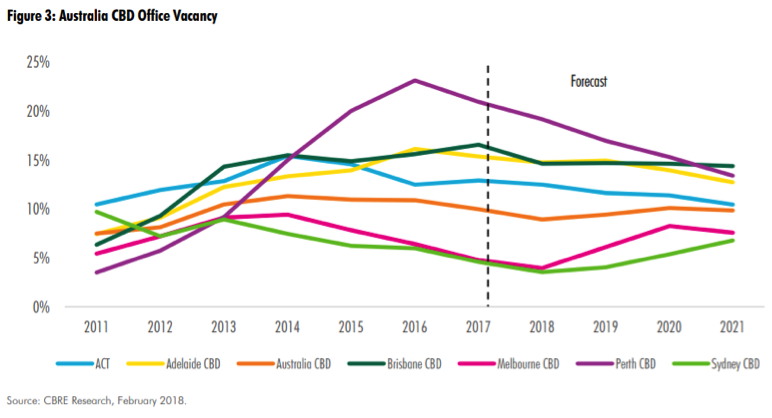 Overall vacancy is also forecast to remain stable at around 15%-16% for CBD office space, although it may dip slightly in 2018 due to limited supply before returning to the 15% mark in 2019 when the new supply cycle starts with the circa 80,000sqm Quarter building. Specific vacancy rates for Prime, A Grade and B Grade property currently sit at 12%, 12.2% and 22% respectively. Brisbane fringe markets such as Newstead, Fortitude Valley and South Brisbane will continue to show slow but steady growth for investment grade assets with strong leases, however assets that don’t offer significant incentives for tenants will remain vacant due to the significant choice on offer. In the medium term however, such assets can provide value add opportunities (especially for underdeveloped assets) if the investor can withstand the negative cashflow in the short-term. The retail industry is undergoing significant structural change and investors must ensure they fully understand the market and complete full due diligence before purchasing a retail property. Headwinds include future interest rate increases (including out of cycle bank increases), increasing household energy and fuel costs, slow income growth, high household debt, the increased dominance of shopping centres, the recent fall of several boutique clothing brands, the pending introduction of international flagship stores and changing consumer shopping habits including the rise of online shopping. Online retail sales now make up 7.1% of the total retail bricks and mortar spend (10.4% higher than a year ago) and with Amazon’s imminent introduction of its hybrid model, this figure is forecast to grow strongly. Despite the threats, ultra-prime shopping strips such Pitt Street Mall in Sydney (3rd most expensive shopping strip in Asia Pacific and 7th most expensive in the world) are still experiencing solid rental and capital growth, however they have high entry costs, yields have been compressed dramatically and they trade infrequently. Average CBD yields have compressed around 50 basis points over the past 12 months and currently sit at around 5.25%. retail space. With construction activity now trending downwards though, the growth in new neighbourhood space is set to reduce. This should keep yields close to 6%. The Newcastle market is experiencing the ripple effect from Sydney and has more growth left in the tank. 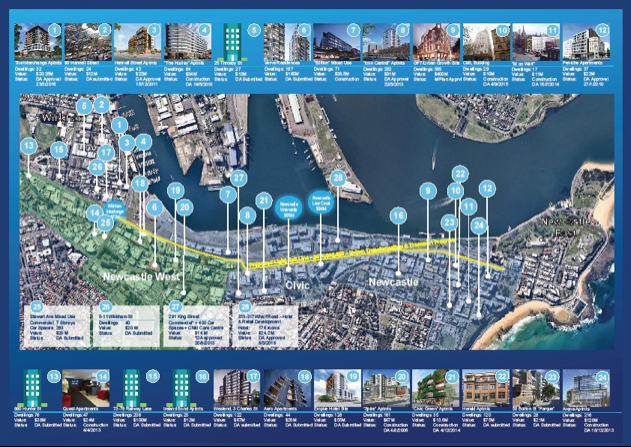 The historical problem with the Newcastle CBD has been a lack of quality stock, however the city is currently undergoing a major revival with around $900m worth of construction activity underway (including the state government light rail and transport interchange projects) and another $640 million worth of development in the pipeline, with private sector investment in residential projects set to overtake government-funded projects over the next two years. Among the big-ticket projects slated to start are the $222 million redevelopment of Hunter Street Mall, the $73 million Verve Residences in Newcastle West and the $71 million Railway Lane Apartments in Wickham. It doesn’t seem like there’s an over-supply at this stage though as most of the commercial space is pre-committed. Businesses are taking the opportunity to upgrade their space and move from the suburbs back into the CBD, which is gradually shifting westwards due to the revitalisation of the Honeysuckle precinct, major projects such as the Newcastle University and Law Court redevelopments, the light rail and Wickham Interchange projects and a multitude of developments in Newcastle West and Wickham (see picture below). Melbourne has experienced similar dynamics to Sydney, although amplified. Prime locations havecontinued to experience strong demand which lead to record low yields, while some neighbourhood shopping strips such as Bridge Road (Richmond), Bourke Road (Camberwell) and Chapel Street (South Yarra) have experienced increasing vacancies and falling rents. Yields bottomed in 2016 with the sale of several commercial properties on yields in the 2% range and even one service station in Fitzroy that sold on an initial yield of 1.53%! Yields are now comfortably above those levels though as interest rates creep up and lending standards are strengthened. Areas that remain strong include Glenferrie Road (Hawthorn), Church Street (Richmond) and Main Street (Box Hill). CBD yields are expected to tighten to 4.82% in Q1 2018 from 5.0% in Q1 2017. 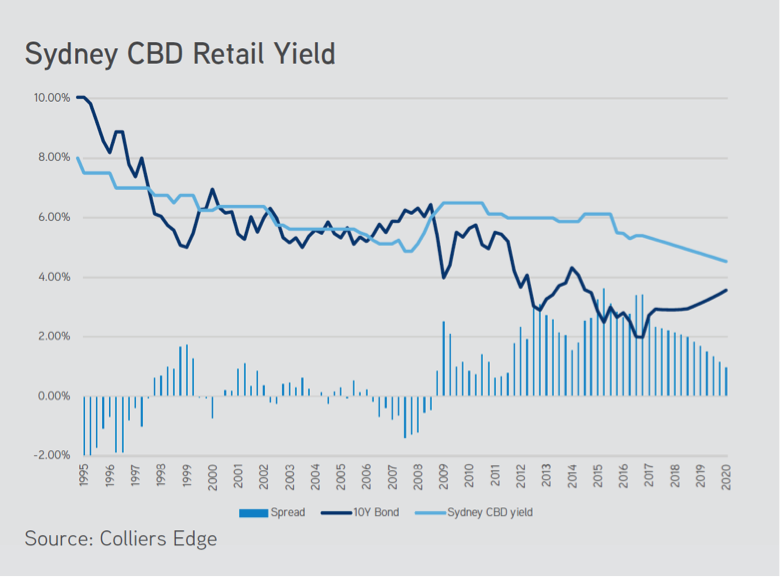 Prime Brisbane CBD retail remains in demand by large fund managers and interstate investors seeking value and higher returns. 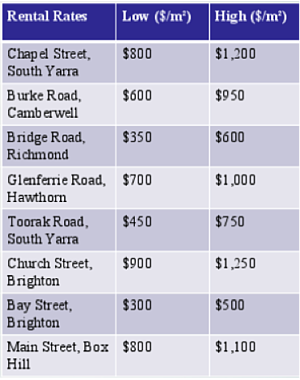 Gross face rents have risen by around 5.7% over the last 12 months and now sit at an average of $4,650/sqm (below that of Sydney at $10,760/sqm and Melbourne at $7,250/sqm). However, this growth figure varies significantly depending on location, with prime locations such as Queen Street Mall growing strongly due to limited supply and demand from international tenants, whilst fringe CBD and suburban locations have remained broadly flat. Yields for strip retail in the CBD currently sit at around 6% and incentives remain a key feature of the market, which currently sit at around 15% of the first term’s gross face rent.